Have you ever tried showing a set or a large collection of digital photos to a friend or relative? Do you remember how they got bored really quickly after seeing a number of all-too-similar shots of the same subject? Get rid of the duplicates automatically! Duplicate Photo Cleaner™ scans your entire collection of images, analyzes their contents and finds the photos that look alike. Starting with v1.0, Duplicate Photo Cleaner can work just like your eyes and spot the best shot of the same subject. Locating similar photos manually works fine if all you have is just a dozen images. But what if you have several hundred? You’ll spend hours sorting through your photos! If you are like most people with a digital camera, you probably have several hundred or even a few thousand digital pictures stored in various folders on your hard drive, as well as on flash drives and other removable media. Locating and removing duplicates can easily become a nightmare, and may eventually take away the fun of taking pictures. Bad lighting and exposure problems, camera shake and digital noise can spoil your photos. When you encounter difficult shooting conditions, you usually take a number of pictures with slightly different settings, so that you can select the best shot later on. Selecting the best picture out of a few duplicates is relatively easy, but what if you have hundreds of duplicate shots? Your friends won't be overly impressed by a series of dark shot and blurry shots before they see the perfect one. Duplicate Photo Cleaner™ analyzes your digital images and automatically selects the best shot, allowing you to move or delete duplicate images in just a couple of mouse clicks. 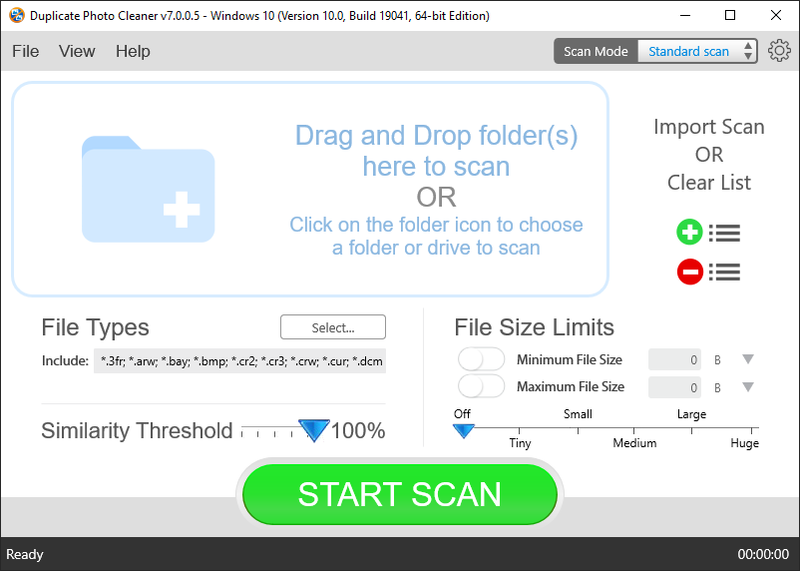 Duplicate Photo Cleaner™ analyzes images by contents, which allows the program to search images by visual similarity. You can search for resized, rotated, and flipped images as well. Unlike similar products, Duplicate Photo Cleaner™ can find both true duplicates and similar photos. It analyzes and recognizes an image's content (this technology is known as content-based image search), and groups pictures that look alike. You can specify how similar the images should be in order to be considered duplicates. View them next to each other or see top ten similar images. Keep only the best shots! Duplicate Photo Cleaner™ is extremely useful in you are a professional photographer, designer, or webmaster. The program is incredibly fast and only takes a minute to scan. When the scan is complete, you’ll be able to see how much space can be freed up by deleting duplicate photos. You can then remove the duplicates with a single click. Additionally, it’s possible to specify which images need to be deleted, moved or copied. The list of supported image file formats includes PNG, JPG, BMP and GIF. Duplicate Photo Cleaner™ has an evaluation period that lasts for 30 days. This trial version finds duplicate photos, but does not allow you to move, delete, or copy them. Duplicate Photo Cleaner has unmatched features and functionality, which makes it one of the best solutions on the market. To help you organize your photos, we will continue to post articles related to our Duplicate Photo Cleaner. Duplicate Photo Cleaner is a ready to use solution for finding duplicate photos. Things like format, resolution, and size don’t matter - Duplicate Photo Cleaner compares actual image data like a human eye! Our articles will help you to find out more about deleting duplicate photos. There are very few things that are more frustrating than a cluttered computer. Having too many unnecessary files can be annoying, but there is nothing more irritating than having a disorganized photo collection with lots of similar images. So, let's work out the easiest and the quickest way to organize your photos! First of all, install a good duplicate photo finder. Make sure that the tool of your choice can match photos by content and highlight the differences. Here is a step by step guide that will show you how to delete duplicate photos with the help of Duplicate Photo Cleaner. Step 1: Launch the program. The Comparison Wizard will open. Select whether you want to compare images within one image group (“Gallery") or between two image groups or two galleries. Step 2: Specify the gallery you wish to search and select its location. You can put different folders on different logical drives into one gallery, which is really convenient. Step 3: Now tell the program what you're looking for - exact duplicates or similar images. The program will search for duplicates using content-based image search. This means that it will compare the photos just like a human eye and ignore things like file properties, name, tags, etc. This technology allows you to search for resized, rotated or flipped images. By default, the program’s similarity level is set to 85%. You can adjust it by going to Tools - Preferences - Comparison in the program’s menu. There you will see a slider in the "Similarity Threshold" section. Adjust it to your liking. The greater the percentage, the greater the program’s accuracy. If you wish to find exact duplicates, set the similarity threshold to 100%. Step 4: Now specify the location where you want to save the results, so that you won’t have to go through these images the next time you search. When that’s done, click on the "Process" button and start the comparison. The comparison process is really fast - even if there are thousands of images in your photo collection, the results will be ready in next to no time. Step 5: Now sort through the results. In the results window you'll find two tabs. The first one presents the whole gallery either as thumbnails or a table. The second tab presents similar photos in pairs with checkboxes near them, so that you can easily delete duplicate photos. Go through the pairs of similar images and delete unnecessary duplicates. That's all! As simple as that! Stop wasting your time and get rid of junk photos in your photo collection with the help of Duplicate Photo Cleaner! You will easily make your photo collections organized and easy to navigate with as little effort as possible. Our photo clone remover does everything automatically - all you have to do is specify where to look for duplicate photos. That's it - now you can sit back, relax, and let the program do all the work. This program is very easy to use. Even though Duplicate Photo Cleaner uses very complicated algorithms that make it possible to recognize photo clones by content, even a newbie can start using the program straight away! All this makes using the program a genuine pleasure. Give it a go - it's absolutely free to try! You will free up additional disk space on your PC. Your computer will become a lot faster when you get rid of redundant copies. In addition to that, your files and folders will become a lot more organized. While working with the program, you will re-live all the sweet moments captured by the photographs. Duplicate Photo Cleaner allows you to preview all the images, so that you will re-discover photos you forgot you had. Finally, the program helps you to get organized - isn't it what a lot of people lack? Children are always doing things which make adults smile or cringe. Since the invention of the digital camera it’s been a real pleasure to take photos of your kids - no more spoilt prints, no more expensive films. However, even though you can take pictures of your child all day without worrying about things like cost, those pictures begin to add up. That’s how you end up having hundreds of brilliant and not so brilliant photos of your children cluttering your hard drive. What you need is a photo organizer. With the help of a photo organizer, you can sort and arrange the photos on your computer with just a few clicks. This will help you to keep on top of all the pictures on your computer and preserve your special memories for years to come. It’s so tempting to take as many shots as you can if you have a digital camera! After all, you can take as many pictures as your memory card will hold and then you can upload them onto your computer. But that can potentially create a digital mess. That’s why it’s best to select the best photos of your child and delete the rest, even though they might seem precious at first. Not to mention annoying duplicate photos. With a photo organizer you might want to spend some time before trying to remove duplicates, as well as any pictures that you are not entirely happy with. This way you will have fewer images, but they all will be true masterpieces. Since digital photos tend to retain high quality even if you're not a professional photographer, it's difficult to choose the photos to keep and the photos to remove from your hard drive. A good way to begin is to remove any of the pictures that have flaws, such as overexposure, blur, and bad lighting. Any pictures that need to be edited should also be removed. Just keep the pictures that are ready to be printed and framed. Keep photos of your child’s first steps, birthdays, graduation, and other memorable events. Finally, keep the photos that make you smile. Use a photo organizer to make your photo collection easier to manage. Start by removing the photos that don't meet your standards, then arrange the photos by date, so that they are easy to find. This way you will be able to re-live every year of your child’s life and enjoy your special memories. Why use photo matching software? These days people love software that does everything automatically, including matching photos. Duplicate Photo Cleaner is a program that can do that and make finding and removing duplicate photos a real breeze. The major aim of such software is to maintain order, help you to organize your photos and free up hard drive space. Many sceptics argue that one doesn't need to use all that software because you can find and remove duplicate photos manually. But why spend hours when you can use photo matching software? Most people have digital cameras and really enjoy taking photographs. If you are one of the few people who hate taking photos and don’t have a digital photo collection, stop reading now. But if you are a genuine photography lover, your collection of images is huge, then read on to find out how to stop wasting hours perfecting your image collection! Duplicate Photo Cleaner is not afraid of huge volumes of work and copes with even the most difficult tasks in no time. This photo matching software has changed the way we collect photos and organize our collections. In the age of affordable digital photo cameras with impressive storage capacities taking thousands of shots is easier than ever before. And modern hard drives have all the means to store thousands of images. However, all this doesn’t help you stay organized. That’s where Duplicate Photo Cleaner can offer you a helping hand. Lighting problems, unstable camera and difficult shooting conditions can spoil even the best images to the point where they are beyond editing. Thanks to content-based search technology implemented in Duplicate Photo Cleaner, digital photos can be compared in just a few seconds, so that you can save the best shots and delete the rest. This software works just like the human eye, so you can be sure it doesn’t delete any great shots. Duplicate Photo Cleaner can look for both exact duplicates and similar files. You can specify the level of similarity and the program will find all the images which meet the requirements. You may view them in pairs or see the top ten similar images and then save the best ones! This photo matching software automatically selects the best image out of several similar files and lets you delete the clones. As simple as that - no more photo clones in your collection! So, if you have a huge collection of images, don't waste your time and download Duplicate Photo Cleaner. Whether you're planning to get a new camera before going on holiday or you expect that your family will, it's always a good idea to get yourself organized in advance. The best way to do it is to delete duplicate photos before the holiday season, and make sure there's plenty of room for everything you will take with that new camera or camera phone. Deleting duplicate photos won’t take long if you use the right software to find unnecessary clones. Delete duplicate photos now to make room for new albums. Digital cameras are great for catching all of the moments of your life. But let's face it, when you use a digital camera, you have a tendency to take more than just a few photos. You take lots! These files can be even harder to deal with than those boxes of printed pictures you still haven't sorted through. To help you deal with your photo explosion, you need to start deleting all the unnecessary duplicate photos. This will allow you to keep only the ones you really like and save you lots of time in the future. The way most people delete duplicate photos is very ineffective and takes ages. Basically, they just look through all of the photos they own, compare them and then delete some. This is a very time consuming process. When you get tired, all of the photos start looking the same, making the process challenging. In addition to that, most people don't keep all their photos in the same folder, so you might need to spend additional time trying to find all your photos on your hard drive. What you may want to consider is using a program that will delete duplicate photos for you. Instead of setting yourself a time consuming and difficult task, you can let the software do the sorting and the searching. All you need to do is to install the program and let it do the job. After just a short period of time, you will see which photos it has identified as duplicates. Then you can decide to delete them forever or move them to another folder. No matter why you want to delete duplicate photos, know that there are lots of options when it comes to cleaning up the photo mess on your computer. And as a result, you will find you have more room for MORE photos, including the high resolution photos. Are you ready to go on holiday and take lots of great shots? If yes, make your computer ready to store them in an organized and effective way.